I'm sure you've seen it. Shop for something and pretty quickly, half the ads you see on the web relate to that thing. And you keep seeing those ads, even after you have made your purchase, sometimes for weeks on end. At first blush, it makes sense, and is the whole reason the ad companies (like Google and the rest) want to track more about us is to deliver ads that target our interests. The obvious is value in terms of making advertising effective for advertisers, but it's also argued that web surfers derive more value from ads that might interest them than we do from generic ads with little relevance to our lives. It's one of the reasons that text ads on search have been such a success. Anything in the ad industry worth doing seems to them to be worth overdoing, I fear, and I think this is backfiring. That's because the ads that pop up for products I have already bought are both completely useless and much more annoying than generic ads. They are annoying because they distract my attention too well -- I have been thinking about those products, I may be holding them in my hands, so of course my eyes are drawn to photos of things like what I just bought. 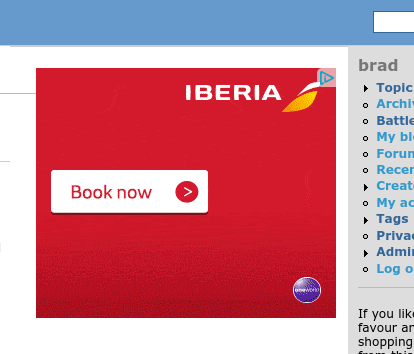 I already bought my ticket on Iberia! This extends beyond the web. Woe to me for searching for hotel rooms and flights these days. I am bombarded after this with not just ads but emails wanting to make sure I had gotten a room or other travel service. They accept that if I book a flight, I don't need another flight but surely need a room, but of course quite often I don't need a room and may not even be shopping for one. It's way worse than the typical spam. I've seen ads for travel services a month after I took the trip. I am not sure how to solve this. I am not really interested in telling the ad engines what I have done to make them go away. That's more annoyance, and gives them even more information just to be rid of another annoyance. It does make us wonder -- what is advertising like if it gets really, really good? I mean good beyond the ads John Anderton sees in Minority report as he walks past the billboards. What if every ad is actually about something you want to buy? It will be much more effective for advertisers of course, but will that cause them to cut back on the ads to reduce the brain bandwidth it takes from us? Would companies like Google say, "Hey, we are making a $200 CPM here, so let's only run ads 1/10th of the time that we did when we made a $20 CPM?" Somehow I doubt it. Use Adblock Plus (or similar). Never see an ad again. Nobody buys anything from an ad anyway. Buyers always do searches to find the best buy. Ad blockers are great of course, but they don't really answer the question of how ads work if they are going to be the primary support of internet business. If we all use ad blockers, there's no ad business. That's fine by me, but as long as there is going to be one, it makes sense to understand both how to make ads efficient for advertisers but also for users. Indeed, the more annoying they make the ads, the more people who will block. A lot of tech support web pages have a feedback function, "Was this page helpful?" There is no reason ads couldn't employ a similar feedback mechanism. Something akin to Facebook's "I don't want to see this" button, with the option to provide additional info: I already purchased the product, I am no longer interested, stop stalking me etc. But syndicates won't offer this for the same reason you cite, more effective advertising means less advertising revenue. It is in the syndicates' interest to shove as much junk down the pipe as advertisers will pay for. thanks! i was wondering the same thing - why waste ad space for a product or service i've already purchased? I had the same problem & seem to have solved it today. I use Firefox browser with a "cookie manager" add-on. The trick is to delete the cookies associated with the ads. Since most, if not all of these ads are coming from Google, I simply deleted all cookies from the Google domain. I may still run into some problems with forgotten password, etc that I will have to re-enter the next time I visit sites, but it's better than seeing all these ads for stuff I have already purchased.